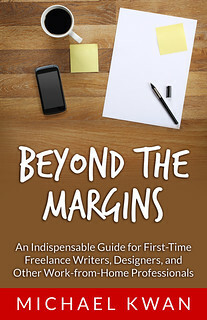 When a potential client asks me for a freelance writing quote, I usually have to ask them whether the project is on a ghostwriting basis or if I will be receiving a byline. This is an important distinction to make, not only for the service provider (i.e., me), but also for the client. From the perspective of the freelancer, which arrangement is the most beneficial? Before we dive into the pros and cons of the two approaches, it’s perhaps best to clarify the difference. When I work on a ghostwriting basis, it means that my name is not attached to the project. The client can take full credit for the work. It doesn’t matter if it’s a single blog post or a longer e-book; the client has every right to say that he or she wrote the content him or herself. On the flip side, a byline is exactly that: a line saying that the work is by Michael Kwan. The client can’t turn around and claim the work as his or her own; I must always receive credit. Somewhere in between these two possibilities are arrangements like co-authorship (as was the case with the book I co-wrote with John Chow). Easily the biggest advantage to a ghostwriting arrangement is that these projects are typically more lucrative. On average, my ghostwriting rate is higher than the rate I would charge on a project where I would receive a byline. In the short term, this results in more income for effectively the same amount of work. That sounds pretty appealing, right? Another advantage to ghostwriting is that you can disassociate from the work. Perhaps you’re writing on something controversial and don’t want to have the opinions expressed to have an impact on your personal and professional life. This is similar to the reason why some authors may choose to use a pseudonym (“pen name”) under certain circumstances. If you make more money with ghostwriting, why would you want to take on a byline instead? While ghostwriting can be more lucrative in the short term, those arrangements can make it more difficult for you to attract more clients. By contrast, a byline works as passive marketing, building up your name as a brand. Potential clients have approached me, because they have seen my name in other publications. They see me writing product reviews on one website and ask if I can do something similar for them. It’s even more advantageous when I have an “author box” in those online publications, because it allows me to put a brief bio, a link to my site, and a link to my Twitter, for instance. This is why I haven’t applied for a gig in quite some time. Clients generally come to me, so I have a less of a need to come to them. This all ties into my word of mouse marketing strategy. Build brand awareness, get people to know me by name, and the work finds me. Is Ghostwriting or a Byline Better? Both and neither. It really depends on the circumstances and I find myself engaging in both types of projects. Ghostwriting can allow me to explore some subjects that are outside of my usual realm and they can prove to be more lucrative in the short term. On the other hand, it is largely through the byline that that I have been able to build up my freelance writing brand. Clients come to me, because they recognize my name from the sites of other clients. The best strategy is likely to take a mix of the two. Where you choose to make the split is up to you. Should Freelancers Pay Themselves First? With the book, did John write separately or did he write, then give it to you for editing and grammar? That would almost be ghosting to me. Closer to the latter than the former. I did get a “with Michael Kwan” credit, though, which has proven useful. Thanks for the detailed explanation on whether to choose ghostwriting or byline writing.